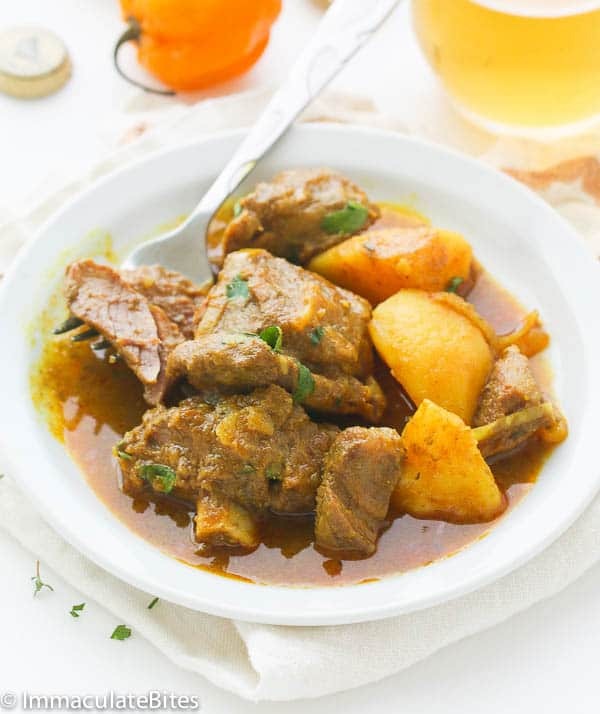 Jamaican Curry Goat – insanely delicious slow cooked Jamaican Spiced Curry that is full of flavour and tender to the bone! An absolutely must-make Jamaican food! So easy to make with minimal prep. If you ask anyone who loves Jamaican food to pick his or her favorite, this Curry Goat, would no doubt, make an appearance on the list. Although goat meat has become increasing popular in the United States due to the influx of different cultures, it isn’t celebrated nearly enough as it should. Most people shy away from it. Not a good thing. In fact, did you know it is the most consumed meat throughout the universe? Its health benefits are staggering when compared to other beefs, including chicken. It has less saturated fat, calories and cholesterol. 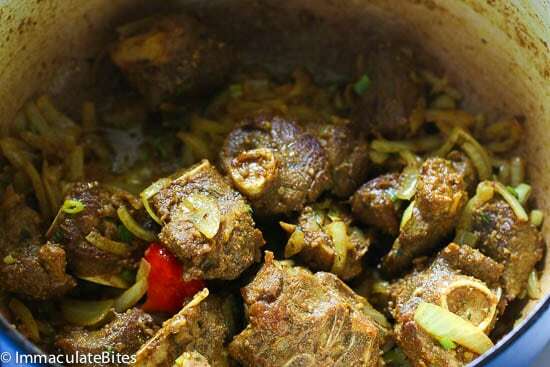 But what gets me most about goat meat is not its benefits, the flavor is quite appealing, cooked properly the meat is succulent tender and rich. You can purchase goat meat at most International Markets –halal markets, or from Mexican and Latin American butchers. Goat meat is comparable to beef shanks or briskets. So feel free to swap the goat meat for these cuts of meat. 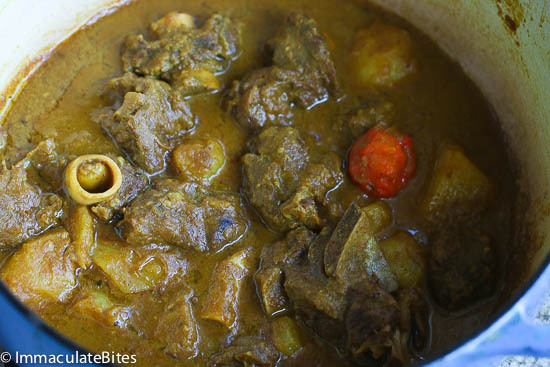 This Jamaican Curry Goat is one of my favorite Jamaican dish — never seem to get enough off of it. 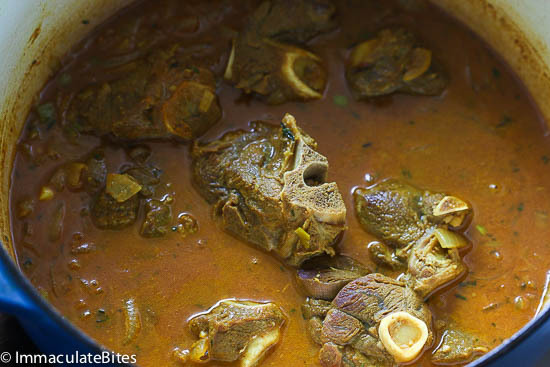 Chunky pieces of goat are slowly simmered in aromatic blend garlic, ginger, thyme, onions, and hot pepper and with curry taking center stage, until thick and creamy or however you like it. 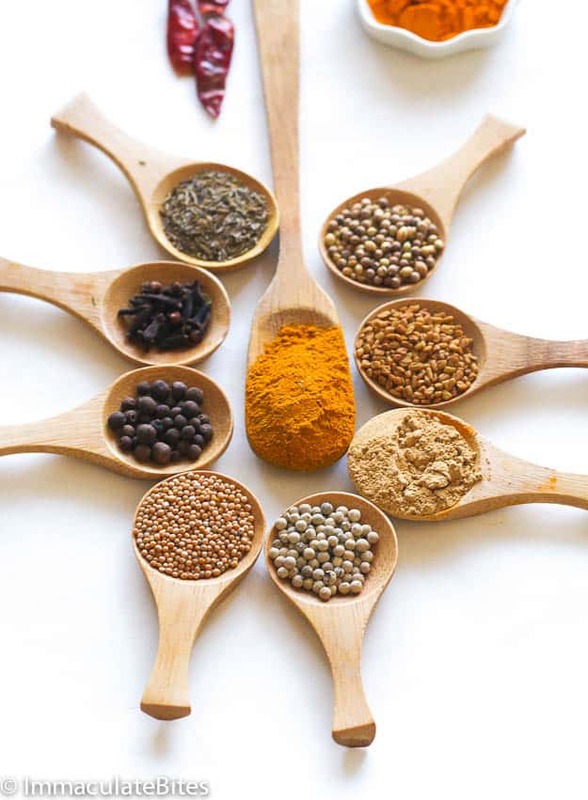 For amazing results try making your own curry powder with this blend here. Use less with this blend because it’s homemade and packs a whole lot of spice in it. No fillers. I like it thick and creamy but have to adjust sometimes for family. In fact, it would be a crime not to savor this curry at least once in your life- time. 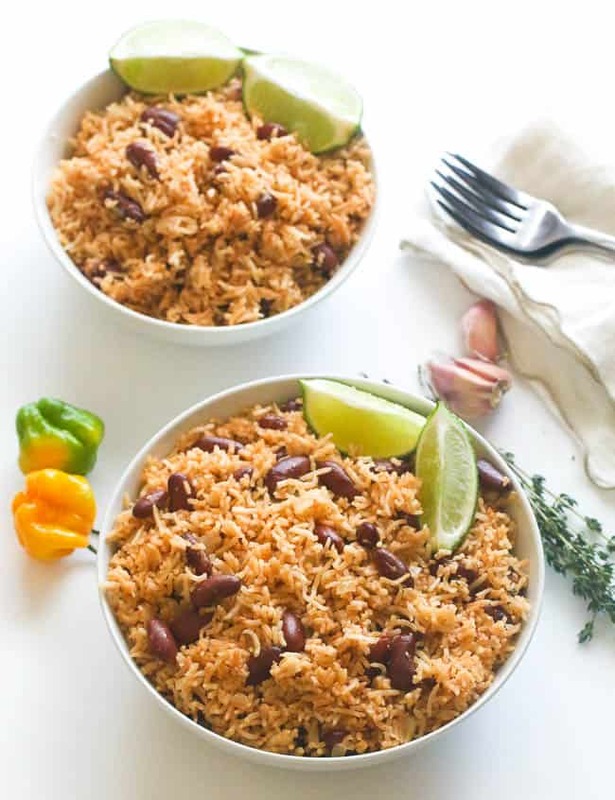 Oh, be sure to serve it with this Caribbean beans and rice right here. You will be happy you did. Enjoy!!! 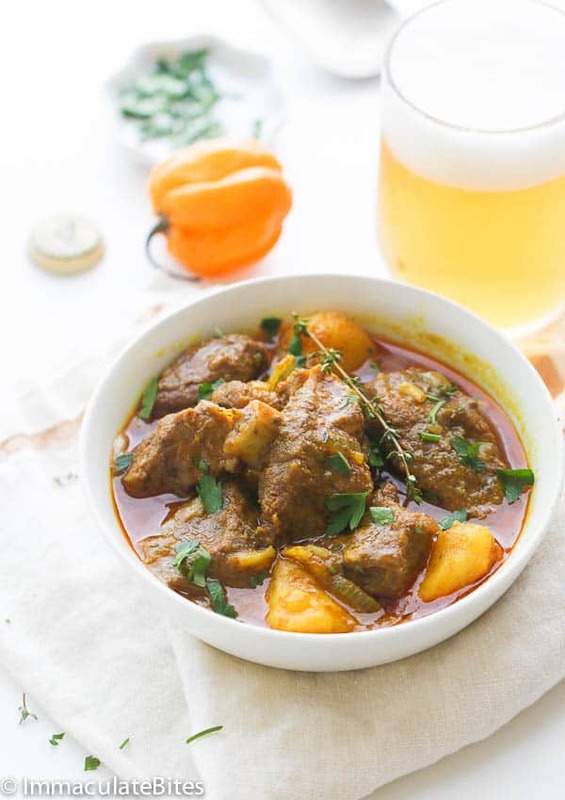 Jamaican Curry Goat – insanely delicious slow cooked Jamaican Spiced Curry that is full of flavour and tender to the bone! An absolutely must-make Jamaican food! So easy to make with minimal prep. In a large pot, heat oil over medium heat, until hot, and then add the goat meat sauté stirring, frequently, any browned bits off the bottom of the pot, until goat is brown. Then add curry, stir for about 1-2 minutes. Add the garlic, white pepper, onions,thyme, tomato paste, scallions (green onions) and scotch bonnet pepper stir for about a minute. Then pour in just enough water to cover the goat and bring to a boil and let it simmer until tender (depending on the goat size and preference) about 2 hours or more, stirring the saucepan occasionally and adding more water as needed..
About 15-20 minutes before you remove from the stove add potatoes and bouillon powder. 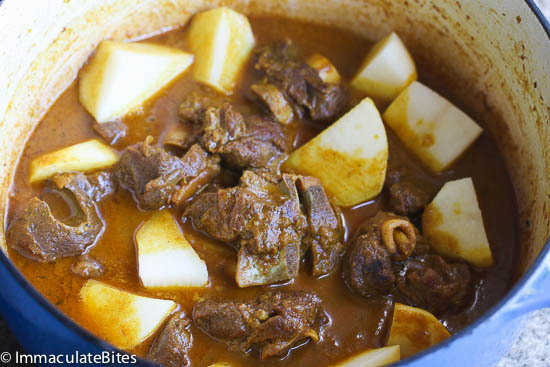 Continue cooking until potatoes are tender, if you want really thick curry goat let the potatoes cook even more . Thank you for sharing. Easy to follow, turned out amazing, better than jamaican food shop! This recipe was easy and excellent. Thank You. I am going to try making this for Christmas dinner as we have a Jamaican in the house. I have a question though, how many pounds of goat meat do I need? It’s listed 3-3 1/2 lbs. What does this mean? It means any amount of meat that’s between 3 -3 and 1/2 pounds would work. 3 – 3.5 pounds is about 1.5 kilo if that’s the issue. The recipe says this serves 6 people but I suppose that depends on their apetite. I would suggest you allow about 400 grams of meat per person (adult) and adjust the rest of the recipe for that quantity of meat. This is lovely by the way. Just go to your butcher/supermarket and ask for that amount in goat meat (1.4-1.6kg). I made this with a mix of Beef Cheek, and Lamb Chops. It was absolutely beautiful. Also topped it with Red Wine instead of water. Really deepened the flavour. Hello! Just wanted to thank you for the recipe. I made it last year for a family member and it was very popular. So popular that I was specifically asked to make it again. Another dish of yours won me serious points with my SO’s family. Thanks again and enjoy your holiday. Wohooo! I’m so happy for you. Happy holidays to you, too. I finally made this yesterday and it is excellent. I had to drive a long distance to get goat, but it was worth it. After reviewing your comments, Imma, I will use beef shanks next time, as it is much easier to find in my part of Michigan. Thanks for a great meal. If you haven’t already, check Middle Eastern stores. Almost all of them carry it, and there are more out there than you’d expect, even in my rural southern state. Hello, Imma. Thank you, thank you, thank you a million times. My sister and her boyfriend recently visited my wife and me for the first time. Her boyfriend is Jamaican and I knew he loves goat with curry. I couldn’t resist the opportunity to make it for him. I’ve made goat and I’ve made curry but never goat with curry. Normally I probably wouldn’t serve something to first-time guests the first time I prepare it so I would be lying if I said I wasn’t a bit nervous. There was no need to be. This recipe was such a big hit. Beautiful, delicious, and fun (with your Caribbean rice) and one of the best goat dishes I’ve ever had. Bless your heart. Paxton, thank you so much for sharing this ! So happy you and your family enjoyed this and the other sumptuous recipes. It really warms my heart that you would take time out to let me know. Hi, Leanne. Leave the scotch bonnet whole. You may add ,if desired . My name is Kiah. And I have been a fan of yours for months now. I love your site and your recipes are AMAZING, EASY AND SUPER DUPER EXTRA DOUBLELY DELICIOUS! I’ve tried so many of them and have loved every one that I tried. Now my question is about this recipe in particular. 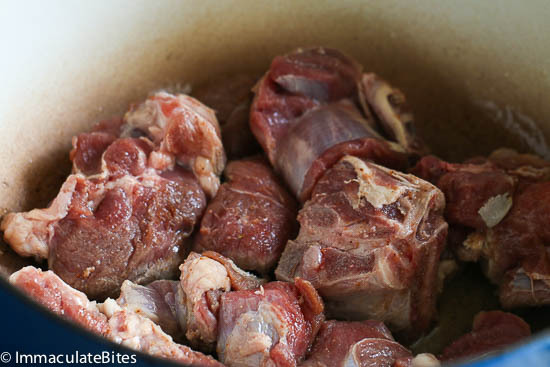 Can I use cubed goat stewing meat or does it have to have the bone in it? we have a celebration of Caribbean culture once a year where I live, and after going and my partner being too fussy too try goat(), I made this today and replaced with beef to keep as authentic as I could without the goat. We both adored it!!! Nicest curry I’ve had! Nothing but compliments from the rest of the family either! I’m glad your family loves it, Ella! Glad to hear it turned out good for you, Eamonn! That curry goat smell is definitely mesmerizing. And thank you so much for all the helpful info. Have a good one! After trying a few different Curry Goat recipes over the years, which have sadly disappointed. I’m happy to report this one is our new GO TO recipe. Authentic and more importantly “absolutely delicious”. I sliced the Scotch Bonnet up to give it a little extra heat and for us it was perfect. I want to make this recipe but cannot have bouillon powder and I definitely don’t want to leave out the extra flavor. What can I use as a substitute? 1 cup of broth? Would that be too much liquid? Hi Danielle! You can replace half of the water with broth. That would help .Happy Cooking!!! My supplies of goat meat have do finally arrived today….. I’m so pleased as I’m so looking forward to trying ur recipe!! I was wondering if I exchanged the scotch bonnet for 2 tablespoons of hot sauce would this work as well? Hi Steph, Yes it would do just fine. Happy Cooking!!! Hi Emma. I’m very interested in cooking this dish. For dinner tonight but I’m confused as to why you mentioned it being confused with ginger, but then didn’t put ginger in the actual recipe? My bad! You really don’t have to use ginger , it works just fine with or without ginger. 1 teaspoon would do just fine . I made this curry last night! With yam carrots plus a small spoon of jerk seasoning and coconut. . Absolutely easy to follow and adapt. Thank you so much. I’m going to cook it today for my family reunion, I hope I can improve on yesterday’s . What a great recipe , I’m so happy I stumbled across this blog. So happy you are here Marie! I really appreciate your kind words and I’m so happy you liked it. Practice makes perfect that’s for sure ! Thanks again and Happy New Year! I made this today and it was sooooo good! Thank you!! Great! Thanks for the feedback! And Merry Christmas! Hi there, I have a couple of questions. 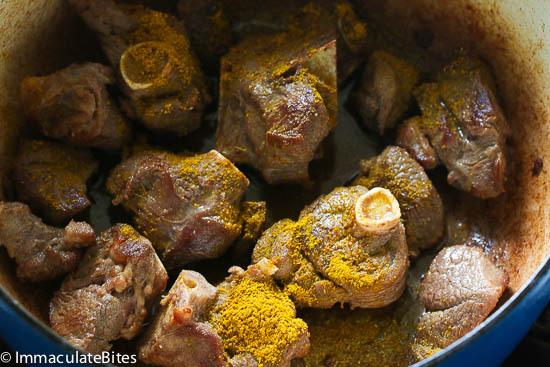 I’d like to cook your Jamaican Curried Goat recipe in a slow cooker. I’ve read through the comments section and see you have recommended it be cooked on high for 4-5 hours – which is great. Just wondering at what point in time the potatoes should be added? I was thinking at approximately the 4 hour mark? And also wondering if you feel it would taste better simmered over the stove as the original recipe states, or if a slow cooker would do just as good of a job. Thanks in advance and I can’t wait to try this tonight. Hi Tammie! I tried both versions and they both deliver in flavor . Just a matter of preference. I usually add the potatoes same time as the goat. Make sure they are large chunks of potatoes. Happy cooking !!! Love love love this recipe. Made it this weekend. An absolute winning dish. Just aroused my taste buds. Thanks a ton Imma for sharing this recipe. Will check and try out other recipes of yours. Oh WOW! Thanks for feedback Divya. Can’t wait to see which ones you try out ! I don’t consider myself a good cook but this came out perfect. I was wondering if I should have marinated the goat overnight like I have seen on other recipes, but I didn’t and it still came out tender and flavorful. THANK YOU SO MUCH! My pleasure ! Glad to hear it worked out well for you. Thank you so much for taking the time to let me know. I had some frozen goat in the freezer that I had bought on a whim and never used. I thawed it out, made sure it wasn’t freezer burned, and found your recipe. I mostly followed it except for the following: I had to simmer much longer for the meat to get tender. The sauce was thin so I thickened with a little cornstarch. I noticed that you mentioned ginger in your narrative, so I threw in a teaspoon of dried at the end. Then for good measure, a teaspoon of coconut sugar. It was delicious with your Caribbean rice! Awesome ! Thanks for taking time out to share such detailed feedback with us. Glad to hear it worked out well for you. YES! Glad to hear it was a hit . Thanks for taking the time to let me know. Hi, when cooking for thr 2 hours is it lid on or lid off? Hi John! The lid is on. I was looking for a recipe for goat, an came across your recipe and had to look no further. 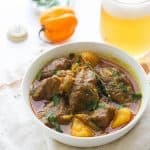 I’m new to eating goat, as my partner is Congolese and he misses, as he would say, “real food”, so I try my best to find recipes that will seem close to home for him. So I will be preparing your curry goat tomorrow. Your recipes are amazing and looks very very immaculate, you now have another subscriber. 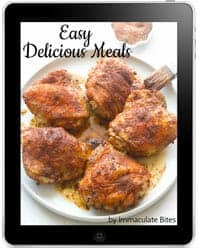 Thanks for creating these amazing recipes!!! Yay ! Thanks for taking the time to let me know kori- it means a lot to me. 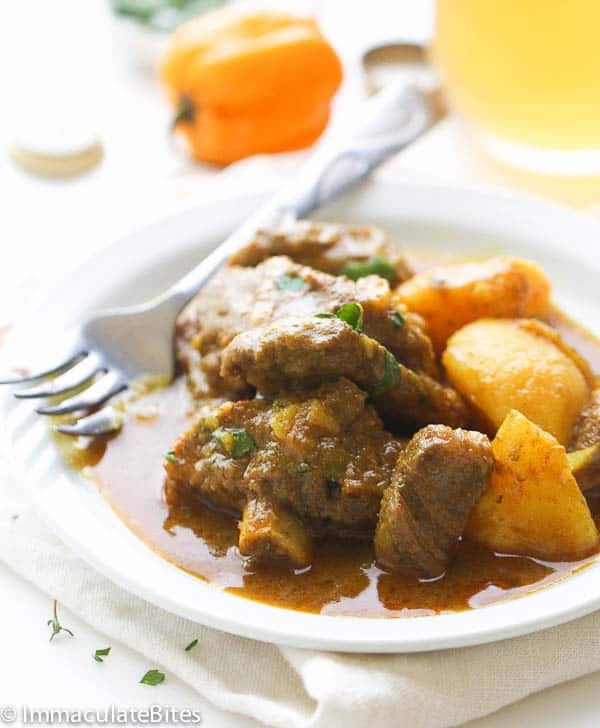 You are going to love the curry goat it’s one of my favorites . This is awesome. My second time making this Curry Goat. Thank you so much. My pleasure ! Thanks for taking the time to let me know April. How long do you keep your curry and rice in the fridge for? Thanks ! Mine lasts for about 5 days. I try to eat it before the 5th day though. Sometimes, I make , divide in half and freeze the other half. Im sure you need to season the meat with the curry seasoning from the night before then scrape off what ever seasoning is on it and then brown it then add the seasoning back in after right? so it marinates and brings more flavor. this looks awesome though. good job. Really awesome tip! Thanks for sharing Jason. I live the recipe. I add carrots and pretty much the actual recipe give or take amounts of seasonings and love it. Awesome!Thanks for taking the time to let me know. You are definitely going to enjoy this too! Do let me know how it works out for you. Thanks ! 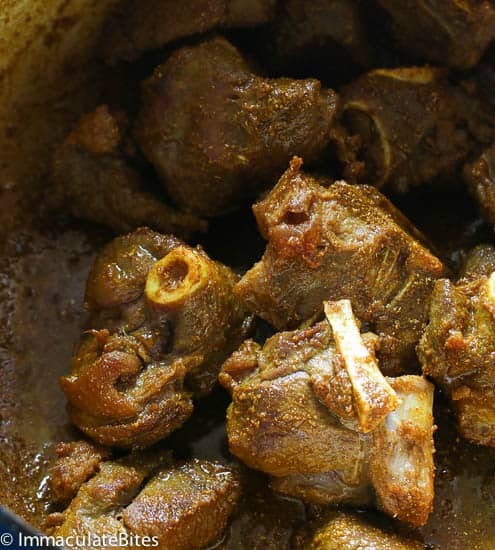 Please stop claiming goat curry as a Jamaican dish. There is nothing Jamaican about it. I made this last night for today and it turned out great! I read through some of the comments and opted for the goat shoulder. Seared meat as per the recipe but covered and put in the oven on 265 degrees (F) for 2 hours. Added potatoes and then cooked an additional 45 minutes. The meat was sooooo tender! I grew up in this, but it was my girls first time having goat. We paired with coconut jasmine rice (no beans). They loved it! Next time will do the traditional rice and peas, yam, plantain and dumpling! Arghhhh! I can’t wait. Thanks for posting! Its serving us all well years later!!!! Fantastic! Oh Boy! You are making me hungry, with those pairings !! !Thanks for taking the time to share your thoughts with us. Hello, I want to try this recipe but don’t have fresh thyme. Can I use dried time instead? Of course! Start with 1/2 teaspoon and adjust as you go, depending on the potency of the thyme. I made your curry today and have some goat marinating in the fridge to cook in a little while in my cast iron dutch oven. So excited!! Thanks for this fantastic recipe inspiration! Which Flavor bouillion powder do I buy, the ones I see are either chicken or beef. either will do just fine. WOW! You sure know how to take this to the next level.. Oh My! The aroma coming from your kitchen must be INSANE! Everything sounds Delicious. You’ve have got me salivating OVER HERE. I am so freaking excited to try this recipe. I have been craving goat for weeks now and have scoured the internet for the best one. Will be cooking tomorrow. Thank you so much for sharing. All love! Awesome! Can’t wait to hear how it works out for you. Thanks! Thank you Imma for this recipe. I’ve been eating goat since I was a young girl, my grandmother raised & cooked them in Georgia. 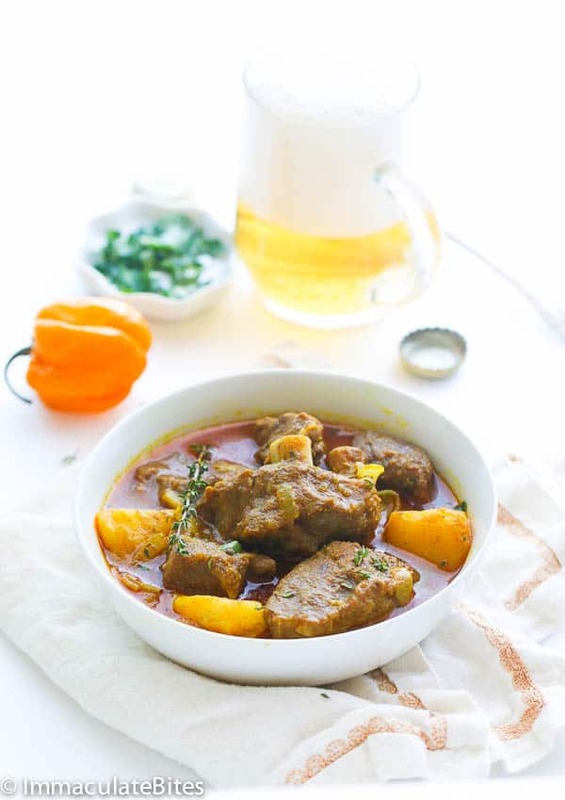 It wasn’t until I a visit to the Caribbean that I had it curried and fell in love with it. You mentioned ginger in your story but not as an ingredient. I added 1 Tbsp of ginger and 1 tsp of allspice to the recipe as well. I also like my gravy thick, but even after letting the potatoes cook down, it wasn’t thick to my liking. I mixed some corn starch with about a cup of the liquid and added it back to the pot to thicken it up. The whole family enjoyed it with the Caribbean Rice & Beans and the Jamaican Cabbage, minus the shrimp. Me too! One of my favorite meat. What works for me is to slowly cook the goat until tender , and that does it for me. Glad it worked out well for you.